This was the first NDEW event hosted by CE-CERT. The event was held in the parking lot under the solar canopies. It was a very hot day, so we were all thankful for the shade. We had 10 booths that included, CE-CERT, Plug In America, City of Colton Public Utilities, City of Riverside Public Utilities, American Solar Advantage, KIGT , Inland Empire Biking Alliance, American Lung Association, Southern California AQMD, and our local EV club, EVAOSC. Riverside BMW provide 2 i3's for test drives and Riverside Chevrolet provided a Bolt and a Volt. 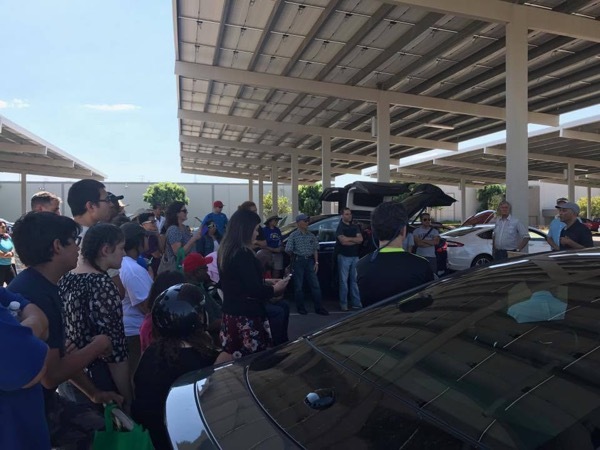 We had over 25 EV owners show up to show and talk about their cars. We had almost every available EV represented. The star of the show was Ned and his Model X, when he had his car provide a musical show. Everyone was enthralled. We were honored to have as speakers: Matt Barth, Director of CE-CERT; Joel Levin, Executive Director of PIA, and Assembly Member Eloise Gomez Reyes. Join Inland Southern California NDEW organizers for a fun event to learn about electric vehicles, charging infrastructure, available rebates and programs, and solar installations. There will also be a ride n drive event. We will be set up under the east side of parking lot under the solar canopy. CE_CERT is located at 1084 Columbia, near the intersection of Iowa and Columbia. It is not on the UCR main campus. There is lots of free parking. Join the National Drive Electric Week event in the Inland Empire being held on Sunday, September 10, 2017 at CE-CERT, University of California at Riverside, 1084 Columbia Ave, Riverside, CA. Information booths for electric vehicles and renewable energy will be under the solar canopy in the parking lot along with ride-and-drives for plug-in electric vehicles. There will also be food trucks and games for the kids. Registered attendees report 616,648 electric miles driven.